CHARLESTON, South Carolina (AP) -- Retired Gen. William Westmoreland, who commanded American troops in Vietnam -- the nation's longest conflict and the only war America lost -- died July 18, 2005. He was 91. 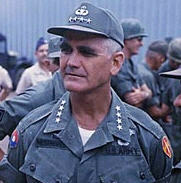 As commander of U.S. forces in Vietnam from 1964 to 1968, Westmoreland oversaw the introduction of ground troops in Vietnam and a dramatic increase in the number of U.S. troops there. Westmoreland would later say he did not know how history would deal with him. He was promoted to brigadier general during service in the Korean War and later served in the Pentagon under Army Chief of Staff Maxwell Taylor. After his tour in Vietnam, Westmoreland was promoted to Army chief of staff. He retired from active duty in 1972 but he continued to lecture and participate in veterans' activities. Westmoreland was married to the former Katherine "Kitzy" Van Deusen and the couple had three children. After an 18-week trial in New York, the case was settled shortly before it was to go to the jury. The settlement was characteristic of the general's ambivalent relationship with the press. He was also a guest at many of the ASA’s Hall of Fame Dinners and made several award presentations. "That became, in effect, his raison d'etre," the son recalled.